I was fortunate enough to be able to buy 200 lbs. of potatoes from a local farm this year, and they were only $.10 a pound. Of course, that means lots and lots of potato soup, baked potatoes, and mashed potatoes. I found a way for us to use up some of the leftover mashed potatoes by making them into potato croquets. Mix together 1/2 cup flour, 2 eggs, 1 cup shredded cheese, 1 tsp salt and 1/2 tsp pepper with 2 cups leftover mashed potatoes. Carefully shape into “patties” and dredge on both sides in cornmeal. like beef tallow or coconut oil until golden brown, approximately 3 minutes. Butter can be used, but be careful of scorching. Flip over and fry on the other side for another 2-3 minutes. Serve with pepper gravy, if desired. Make the gravy by first melting 4 tablespoons butter in a pan, and adding 4 tablespoons flour. Allow to cook for 1 minute to remove the “raw flour” taste. Add 2 cups of milk, 1 tsp salt and 1 tsp pepper. Stir constantly, allowing gravy to thicken. Perfect as a side dish, for breakfast or any time. These look great! We’ve done a similar vegan version with leftover beans and veg mixed into the potatoes, but I didn’t develop the recipe enough to publish. 200 lbs of potatoes? Wow! You definitely have been busy cooking various potato dishes! Wow 200 potatoes, your very ambitious. Looks like a tasty recipe, I’ll have to try it. Yummy! Were they russet potatoes? These look absolutely delicious and perfect for me! I am very bad for making way too much when I make mashed potatoes and end up throwing out most of it. Pinning for the next time I do that! Looks like a delicious alternative to some other potato sides. Great way to mix it up. I can’t get over the 200 pounds of potatoes being purchased! I have a family of 11 and I wouldn’t even know where to store 200 pounds of potatoes! 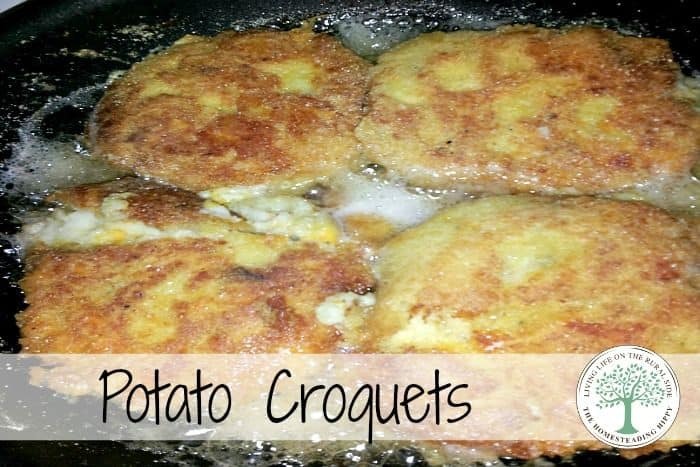 These look like my potato cakes; we had them just last week and you are right they are so good. I was using my leftover mashed potatoes, too. Those look absolutely delicious. I love potato in every all forms, lol. I must try this out, definedly. I hope u did some canning with 200lbs of gators? yes, as a matter of fact, we canned and dehydrated a LOT of them! Admittedly at first I thought it said “potato crochet” and I was excited to learn to make a tater. But now I’m hungry and these look so dang delicious! Hi Brittnei and welcome! Thanks so much for coming~! That looks really easy to do -I think I would try that when we have potatoes around 🙂 Thanks! I just got some Yukon Gold potatoes and wanted to do something a little different with them. This is perfect! Thanks! One of my fond childhood memories is of warm potato pancakes with lots of applesauce.